Have you ever spent a fortune on data roaming while travelling? Use this guide to make a wiser choice next time you travel. DATA ROAMING OR PREPAID SIM CARD FOR TRAVEL: WHICH ONE SHOULD YOU GET? Staying updated on social media and connected to the internet has already become part of our beings. The line between necessity and luxury has turned into a blur. This fact doesn't change or even more so emphasised when travelling. But, there is another truth that comes with this - a sad one. HUGE phone bills as a result of keeping data roaming turned on with overseas (or forgetting to turn it off). Luckily, there are diverse and cheaper options to stay online while travelling for Singaporeans. Let's consider a few popular ones. Buying a local SIM card in the country we're travelling to is an easy and sensible choice. Prepaid SIM cards now have allotted data allowance for a designated number of days and this is a good option when you are travelling for an extended period of time in a country. You can research options prior to your flight. Or, you can ask counters at the airport for the best telcos with offers that suit the duration of your stay and the activities you planned. 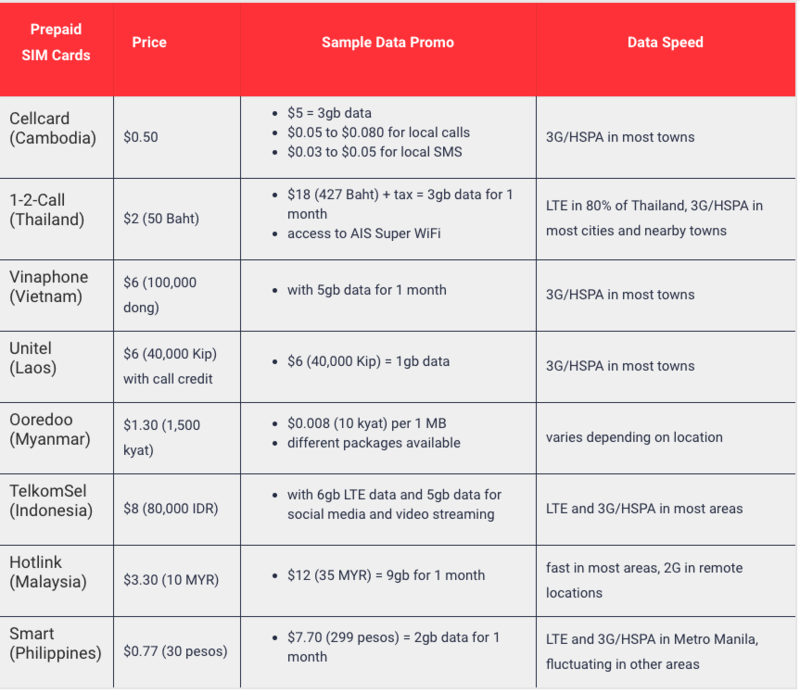 Asian telcos, actually, have pretty affordable promos for travellers. 1. Take note of the SIM card size your phone uses: nano or micro. 2. Remember where you place your Singaporean telco SIM card to avoid the hassle of having to deal with paperwork. 3. Most smartphones these days require a pin to unlock the SIM tray. Not all prepaid SIM packages include them (especially in Asia), so remember to carry when you travel. 4. Be prepared to wait in line at the airport as there will be other tourists who opt for local prepaid SIM cards as well. You can also purchase online but claiming your reservation at the airport stall may require queuing up, too. Renting a WiFi router when travelling overseas is the best option for families and those travelling in groups. It can connect multiple devices, and you can split the bill for the rental and usage fees. Changi Airport's WiFi router rental is priced at $5 to $12 daily. You can check your bank and favourite merchants for partnerships with Changi Airport WiFi Router rental promo codes. This option is the easiest to set up because avoids the hassle of having to set up a new SIM card. 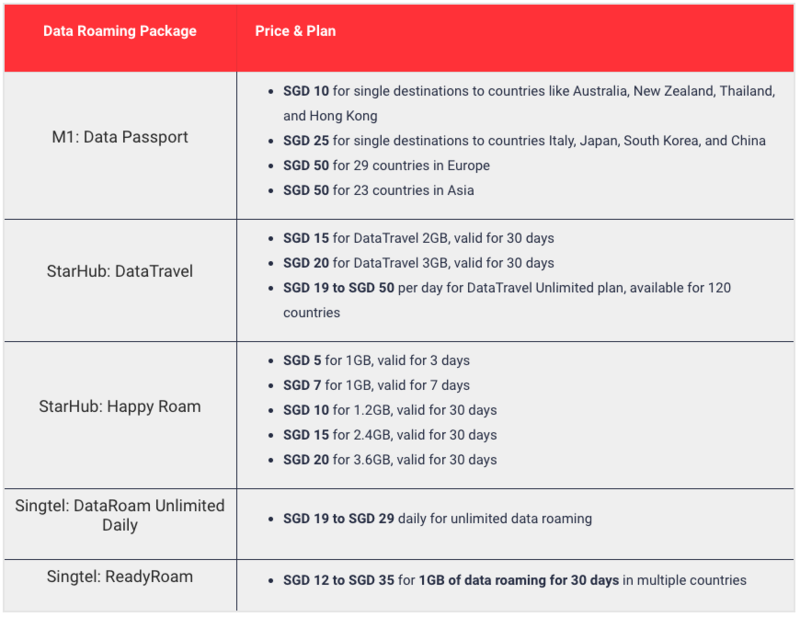 DataRoam from Singtel charges $19 to $29 daily for unlimited data roaming. A flat fee from $12 to $35 gets you 1GB of data roaming for 30 days in multiple countries with Singtel's ReadyRoam plan. It may not be too much but it could be a good option for backpackers. There you have them - your data plan options for your travel endeavours. Now, it's your choice! There's nothing stopping you from staying updated and connected when you're overseas.